Polymers and master-batch for manufacturing E’GRID Geogrids have been strictly tested and selected and performance confirmed in the Research and Development laboratory. 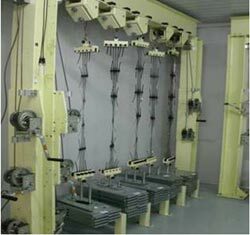 The production line is fully monitored by computerised automatic control system. 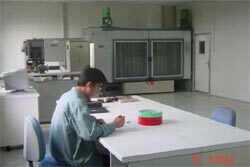 The products are tested in strict accordance with relevant International Standards and stable properties are guaranteed. 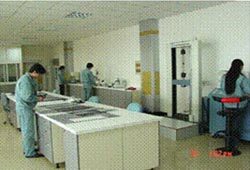 The suite of fully equipped laboratories enables the company to keep abreast of the needs of the market. Material evaluation and product development and testing are carried out in-house and in close cooperation with suppliers academic bodies and customers. The Development Workshop where large scale samples can be punched and stretched under a wide range of different conditions to evaluate raw materials, develop new products and evaluate start up conditions for first production runs. All equipment has been specially designed and manufactured for automatic operation with preset control of all conditions. The exposure of un-protected polymer materials to UV Light including sunshine will cause photo-degradation and aging with a loss of mechanical properties. The UV resistance property of geogrids is greatly improved by the optimum content of finely divided, weathering grade carbon black. Insufficient carbon black content, large particle size or uneven dispersion significantly reduce the effect on UV resistance. Regular testing according to international standards of carbon black content and dispersion ensures the consistency of UV resistance of E’GRID Products. Tensile testing in accordance with EN ISO 10319 is an essential part of factory QC System. All results are analysed and recorded for future reference. A good creep performance under sustained loading is essential for the successful use of geogrids in critical structures such as walls abutments and steep embankments. BOSTD Geosynthetics Qingdao Ltd. is one of the few geotechnical product manufacturers in the world with the necessary creep testing facilities in-house to ensure that its products meet the stringent requirements of international standards and that make this data available to design engineers. Results from tests carried out in the company’s suite of temperature controlled laboratories are used to safely predict the product performance for design lifetimes of 120 years or more. By testing at ambient and elevated temperatures the creep behaviour is accelerated.